This brand new townhome has that rare ability to make you feel like you are already home the moment you walk in the door. You will marvel at its combination of upscale city living with the generous space and outdoor amenities. 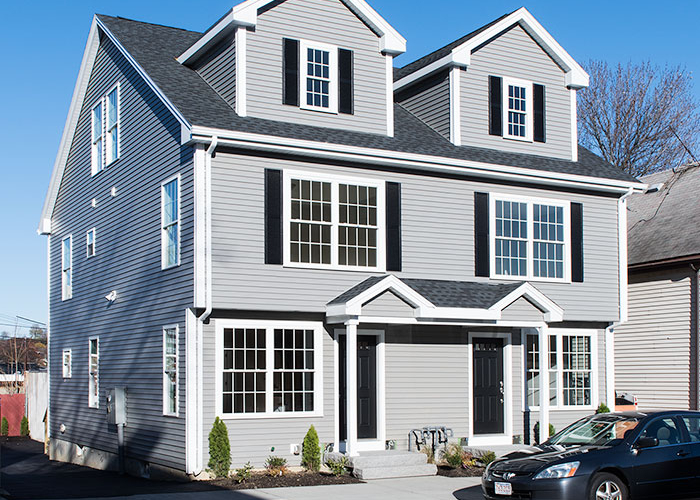 This new construction townhouse is pristine, crisp and the contemporary design creates a feeling of true luxury and comfort in every inch of the four spacious floors! The sumptuous private master suite with in-suite bath on the third floor is a stunning, treasured place. The second floor features two generously sized bedrooms with two closets each, a stylish full bathroom and convenient laundry hook-up. The sun-splashed first floor has a spacious living and dining area with an open kitchen that features amazing cabinet space, granite counters, sleek stainless steel appliances and a lovely breakfast bar. Such a great space to both entertain and for everyday living. The over-sized deck off the kitchen is the perfect outside escape and the lower level bonus basement is ideal for storage or to easily re-finish in to a rec room, work-shop and more coveted living space. With eight foot ceilings it eagerly awaits your final transformation! Of course there is parking and easy access to the Blue Line T, making commuting a breeze. Minutes to the Tunnels, Airport and Beach, the location is beyond convenient. Yet it is just off the beaten path of the hustle and bustle of Boston’s favorite new neighborhood, making this a tranquil and peaceful place to call home. The developer did such a brilliant job so no amenity was spared and the result is fabulous! But with anything this exceptional, it will go quickly, so hurry!